At the time of its opening in 1925, The Redmont Hotel Birmingham, Curio Collection by Hilton offered luxurious and state-of-the-art features, such as private baths attached to each guestroom, chilled running water, and ceiling fans. Today, the newly renovated boutique hotel combines historic charm with touches of modern flair. Stepping inside the hotel, guests are immediately transported to a by-gone era by its beautifully maintained original details, vaulted ceilings with decorative moldings, a custom 10-foot crystal chandelier, and an expansive marble staircase featuring its original, ornate iron handrail. With jewel-toned finishes throughout each guestroom, accompanied by marble-clad baths, The Redmont offers an entirely new luxurious feel to anyone visiting Birmingham's historic downtown. 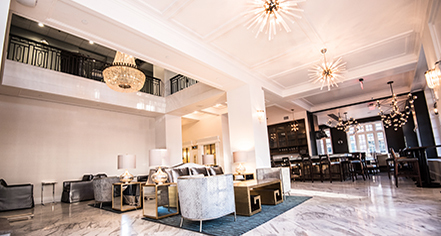 The Redmont Hotel Birmingham, Curio Collection by Hilton, a member of Historic Hotels of America since 2016, dates back to 1925. American singer-songwriter and musician Hank Williams spent the last night before his death, New Year’s Eve 1952, at the Redmont Hotel. Early Check-In/Late Check-Out: Early Departure Fee: 100% room night on first night, 50% room night on sub-sequential nights. Late Check-Out Fee: 50% room night. Hotel/Resort Fees & Taxes: Taxes: 17.5%. Occupancy Restrictions: Varies by room. Parking: Self-parking: Not Available. Valet parking: $22.00. Secured: Not Available. Covered: Not Available. In/Out Privileges: Available. At the time of its opening in 1925, The Redmont Hotel Birmingham, Curio Collection by Hilton offered luxurious and state-of-the-art features, such as private baths attached to each guestroom, chilled running water, and ceiling fans. Today, the newly renovated boutique hotel combines historic charm with touches of modern flair. 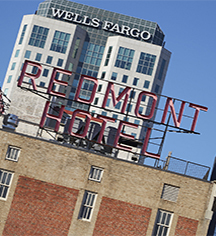 Learn more about the History of The Redmont Hotel Birmingham, Curio Collection by Hilton .